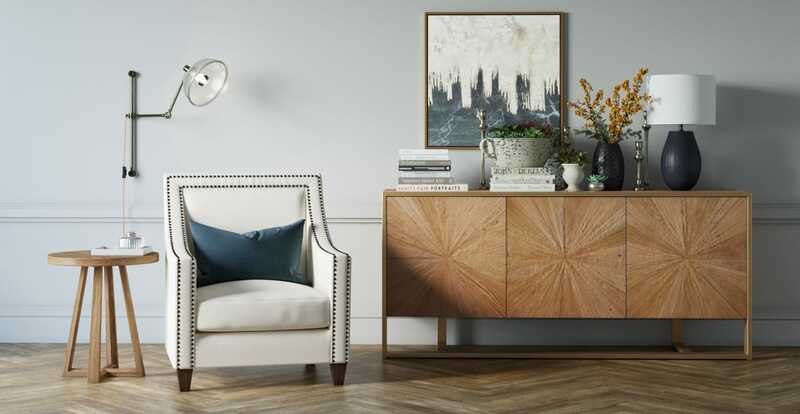 Inspired design paired with refined details is what makes the Dianna Armchair so appealing. Sweeping, angled curves are accented with polished bronze studding. Style it with the rest of the Dianna Collection. The Dianna Armchair adds a beautiful focal point to a room. And it’s been designed with practicality in mind, too. Thoughtful construction and carefully chosen materials ensure ultimate comfort. Choose any colour that your heart desires. With a spectrum of shades to choose from. We’ve given you the choice of Warwick Mystere Velvet or our Signature Premium fabric blend. The Dianna is sophisticated without being over the top. Dress it up in a formal lounge setting, or give it a relaxed edge by matching with simple contemporary furniture pieces. See more armchair designs. Very inpressed with the whole service and would buy again and suggest to others. Looking forward to my next purchase. Great designs & nice quality at a reasonable price :) very happy with all my pieces. Furniture amazing, service amazing, staff and delivery people friendly, hip and respectful! We received our 2 Dianna armchairs and are extremely happy with the purchase. They are generous in dimension and scale, even our tallest friends fits comfortably in them. Excellent execution in fabric tension and stud detail. The fabric is of high quality and exactly the colour of the swatch I received from Brosa. Well padded and solid chair structure makes the chairs feel substantial and lend a great presence to them. See, touch and feel our fabrics used on our Dianna Armchair. For Free! Simply select up to 3 fabrics and add them to your cart. Delivery is on us. Good news! Dianna Armchair is currently on display in our Alexandria Collingwood studio.